Looking for a fun, family-friendly activity this Saturday morning? Want it to be free, or nearly so? Best of all: Want to make the world a little better while you do it? Well, we’ve found something for you that checks all those boxes. Cinemark is partnering up with WE.org to offer free kids’ movies and discounted concessions for Community Day this Saturday, Aug. 20. You and the kids can catch your favorite DreamWorks flick free of charge, and pay just $2 apiece for small popcorn, sodas and packaged candy. Net proceeds will help fund youth empowerment and service learning programs right here in the U.S.
Free movies and cheap goodies for a cause? Now, that’s a deal we can get behind. 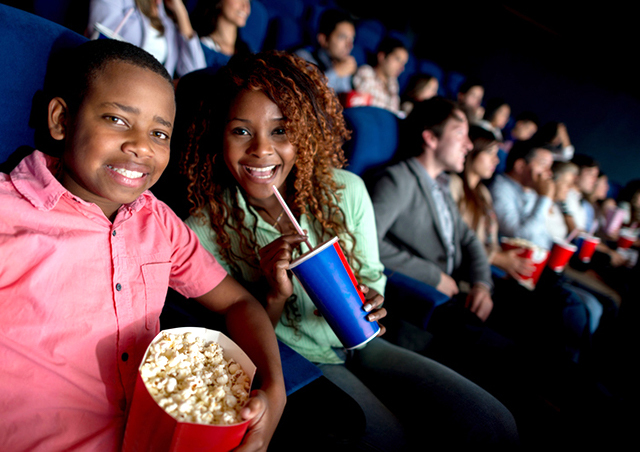 Your theater might be playing “Kung Fu Panda 3,” “Home,” “How to Train Your Dragon 2,” “Madagascar 3,” or “Shrek” — so you and the kids are sure to enjoy the show! Showtimes start at 9 a.m., with the last available showing around 11 a.m. The specifics vary by location, so call or click to check the deets at your local Cinemark. Showtimes and film selection should already be available at your theater’s website or box office. You can’t reserve tickets ahead of time, but they’ll be available at the box office starting at 8:30 a.m. on Community Day (again, Saturday, Aug. 20). Then, sit back and enjoy… not just the movie, but knowing the money you spent on snacks is going to help kids who need it! Your Turn: Will you head to your local Cinemark this Saturday?